Doesn’t World War II feel like a while ago? To many of us, it is. But if you really think about it, it happened less than 100 years ago, which isn’t exactly a long time! 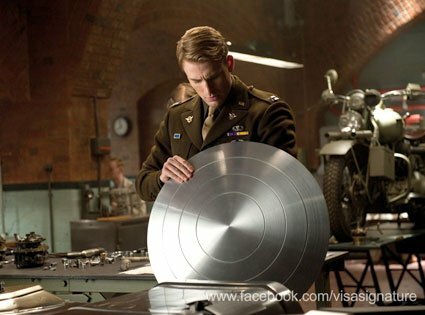 Captain America: The First Avenger places us into an alternate timeline during World War II. The year is 1942, and the war seems to be going the way of the Axis. With a force as large as the Axis, certain sects fall through the cracks, and one of these is known as HYDRA, a Nazi sect led by Johann Schmidt (Hugo Weaving). Schmidt and his group raid Norway and soon find what they were looking for in the Tesseract, a glowing blue cube that holds great power. Bad news for the Allied forces. Enter Steve Rogers (Chris Evans). Steve wants desperately to serve his country during this tumultuous time, but his medical files and abnormally weak frame do not inspire confidence in examiners and recruiters, so he is constantly rejected. Luckily, Dr. Erksine (Stanley Tucci) is enamored with the young man’s courage and pulls a few strings to get him into basic training. The basic training is actually a test to see who will be the best candidate for the new supersoldier program. Despite being the least imposing, Rogers proves to be exactly what the program needs, which is first and foremost a man with great heart and selflessness. So Steve undergoes the procedure and is transformed into a cut, strong, and perfect prototype soon to be known as “Captain America,” protecting and defending USA and her ideals. What a difference a few years makes. I remember viewing this movie and recalling that I mostly liked it and thought of it as a top Marvel movie. After a rewatch? It is enjoyable enough but not on the level of some of its Marvel brethren. At times, The First Avenger does not feel like a superhero movie. Maybe it was what the filmmakers were going for, aiming for this sort of idea that Steve Rogers is not a superhero, but just a man who has great resolve and patriotism who happened to be transformed into this prototypical mold, and that all of us have some Steve Rogers inside of us. So be it if that is the case. This is not a negative on the character, but more so on the plot. Speaking of the plot and some of the characters, they meet the minimum. Pretty cliched at times, but it comes with the territory of the period portrayed in the film. We know who is bad and who is good, but that is really about it, and the motives are never entirely clear. Johann Schmidt (The Red Skull) is not in any way imposing or even that interesting. He and HYDRA are faceless and dull personalities that ultimately serve as just a plot device to get us to Captain America squaring off against them. I am not an avid comic book reader, but I cannot shake the feeling that he, like The Mandarin from Iron Man 3 is probably better represented in that particular medium. Similar to that film character, severely underwritten. Other characters like the colonel played by Tommy Lee Jones and the commanding officer Peggy Carter played by Hayley Atwell too are cliched and predictable. Not all is negative. Marvel, or whoever does it, deserves to be commended for the casting of its titular heroes. 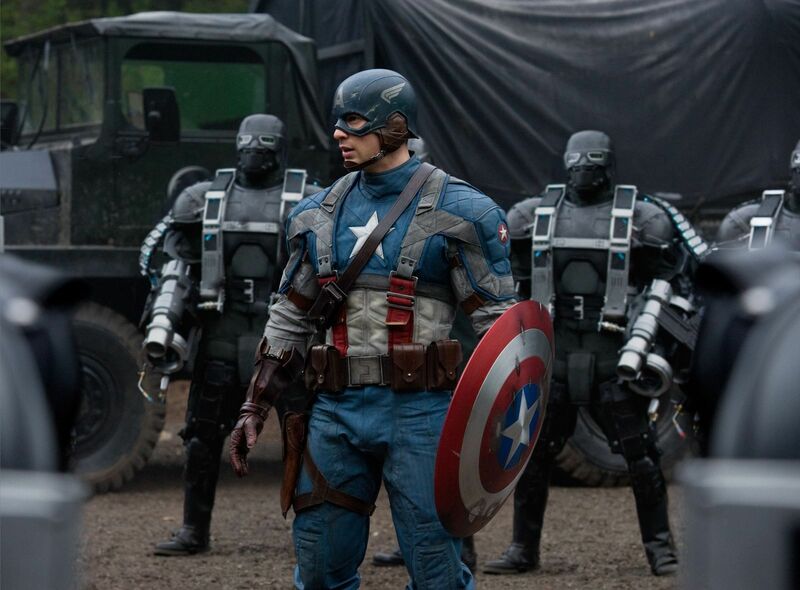 Chris Evans looks the part as the all-American yet humble super soldier. As for his performance, it was respectable but it did feel indicative of a man who turned down the role three times before he finally accepted it. This is to not say it was bad or even underwhelming, but he seems unsure of himself in some scenes as opposed to The Avengers, where I completely bought him as the Cap. Practice makes perfect. On the subject of The Avengers, the ending of this film tied in beautifully; the perfect set-up while still being pretty believable. And I was very surprised at the digital “plastic surgery” done to make Evans look like an underdeveloped 20ish year old man. Only one time did it look suspect, so much credit has to be given to the appropriate people for making that look so convincing. The action is passable but unimpressive. A lot of slow-motion was employed with the predictable “jump from explosion” moments, and it rarely looked cool, aside from the shield in use. The computer-generated imagery, which was praised a few sentences ago, does not meld so seamlessly in the fight sequences. On the whole, the fight sequences are lacking in quantity. There is a montage of Captain and his unit going into various Axis strongholds and eliminating the opposition, but it is such a wasted moment. As an audience, we should be seeing his growth in his newfound powers further displayed in longer battle scenes and building a connection with Captain America, not shown a recap of it. 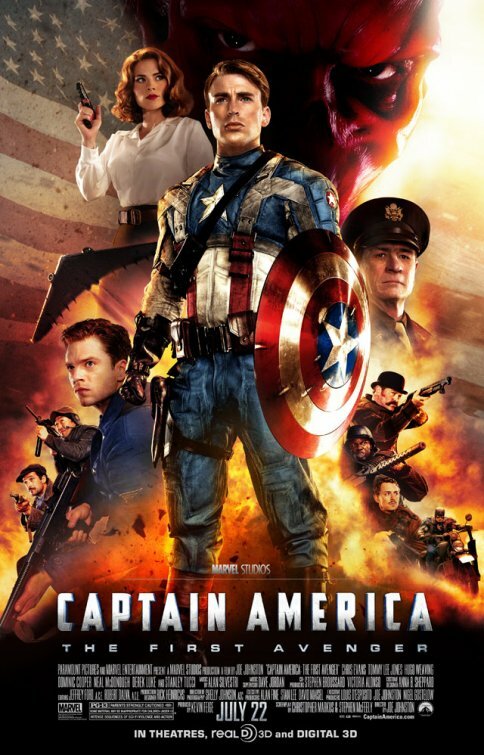 You would think that Captain America would be the easiest Marvel avenger to “get right” on the silver screen. However, a further look can show that may actually be the hardest one to nail. Since the character relies on so many past ideals and is based on the old traditional hero archetype, it is harder to relate to and even believe. Despite my issues which will not hold for everyone, the film does well enough and does what it needs to do in introducing the first avenger into the Marvel universe. I do think that Captain America: The Winter Soldier will be a big improvement, but this film should be seen first if not done so already. This got high reviews on major sites for some reason and I never really understood why. It isn’t bad per-say but it sure isn’t anything special either! The Red Skull is made into a total bore so the film lacks a villain. I do have high hopes for the second though and Winter Soldier is a great bad guy from what I hear. I know the comic version is, but so was the comic version of Red Skull! Gulp! I do think this will be better though! I like this one considerably more than you, probably because I find the characters more interesting than you do. In fact, this is my favorite of the Marvel standalone projects. At least so far. But great review all the same! Thank you for the feedback. If I had to rank, I would probably place The First Avenger after Iron Man and Thor in Phase 1 films. But it certainly isn’t bad! I would have Iron Man 1 second. But the first Thor? That would be last. By a fairly wide margin – I did not like that one much.